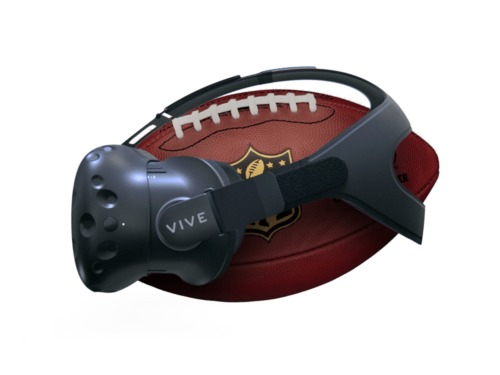 DirecTV’s experimental lab, simply named DLAB, asked me to imagine a football-based VR & AR social viewing experience that would work on all major platforms, from the Vive to Gear to Hololens and others. I had never experienced VR before this assignment. Show Intel FreeD, social, fantasy and ecom integration. For a full week I ate, slept and breathed VR. 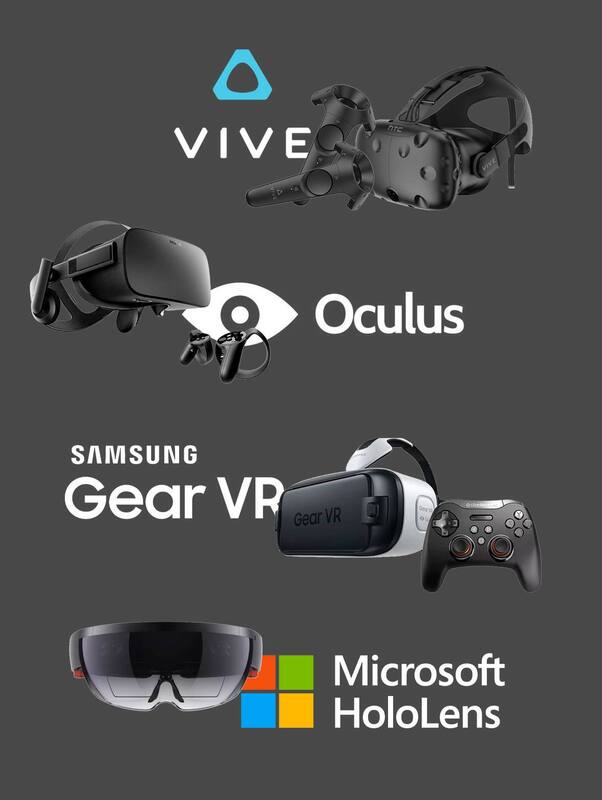 I had access to all the major VR platforms and was able to evaluate them, learning the pros and cons of each, taking copious notes. 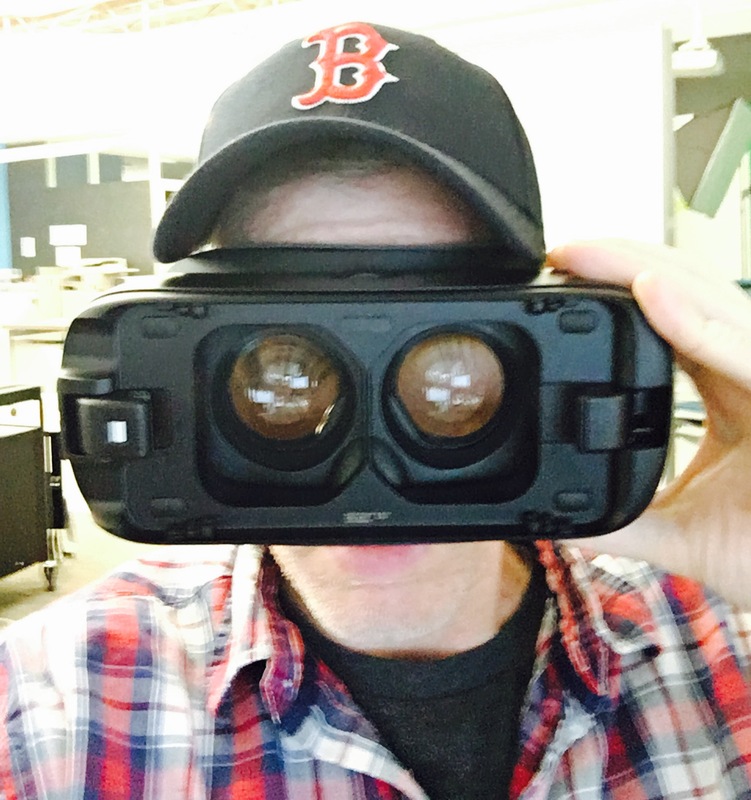 I read and watched anything and everything VR UX related online. Inspiration was beginning to flow. Everything begins in my sketchbook or a white board. 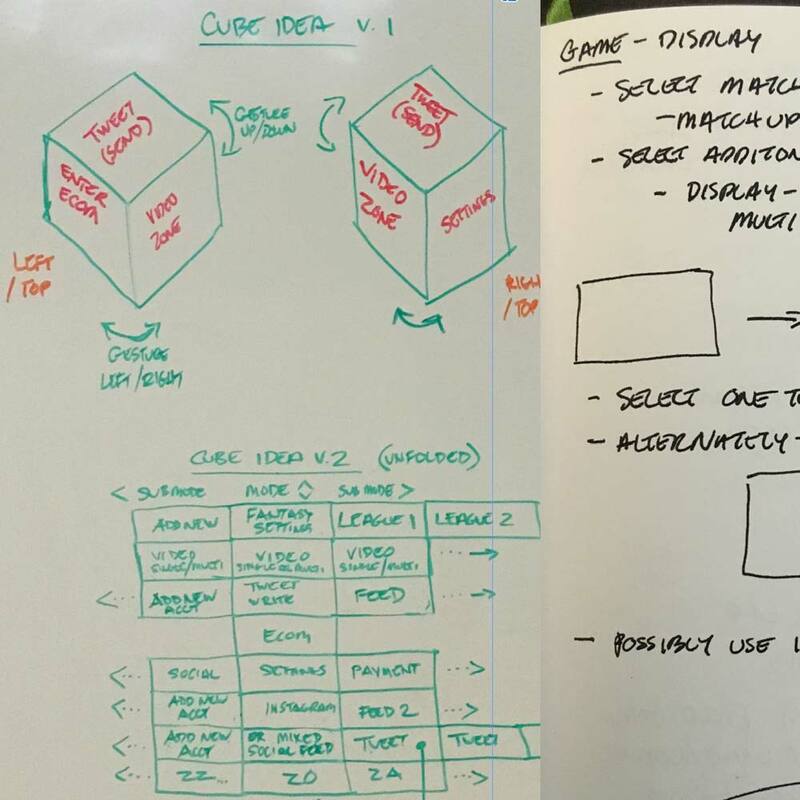 The ability to rapidly express ideas is invaluable to the creative process. 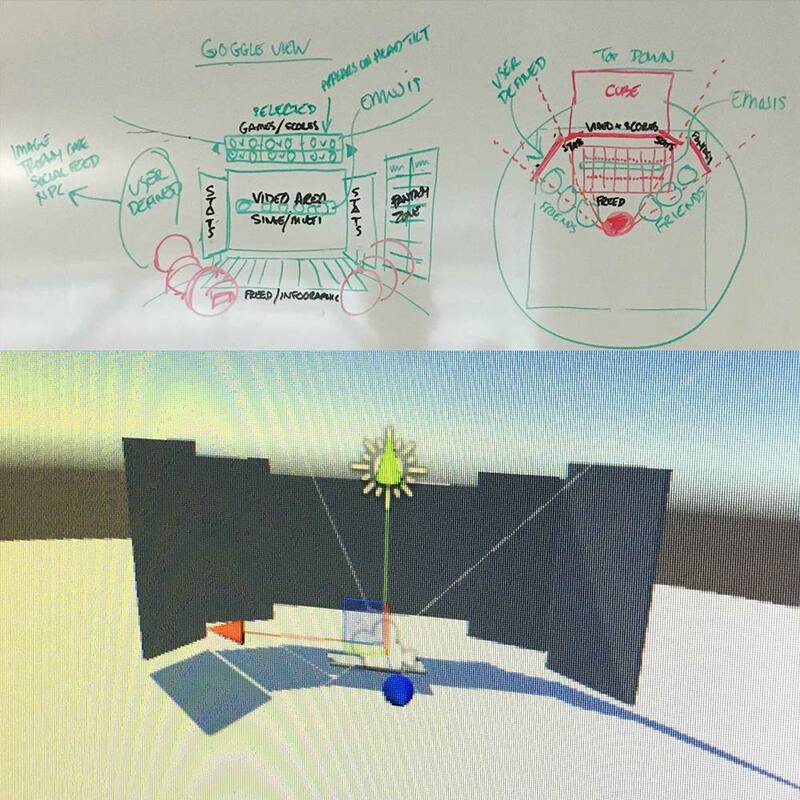 I developed a rough environment based on VR best practices with regards to achieving maximum stereoscopic effectiveness and comfortable UI component usability distances. 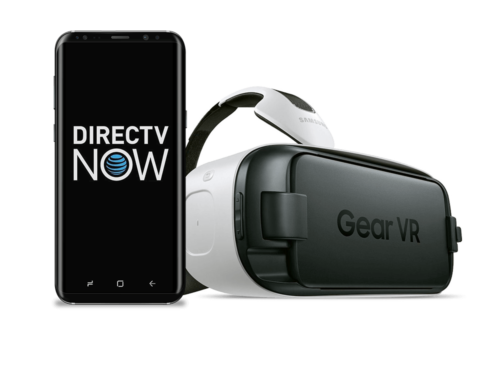 In a 2d world UX best practices on mobile such as distance from button to thumb evolve in a VR UX to head turning radius and viewing angles. 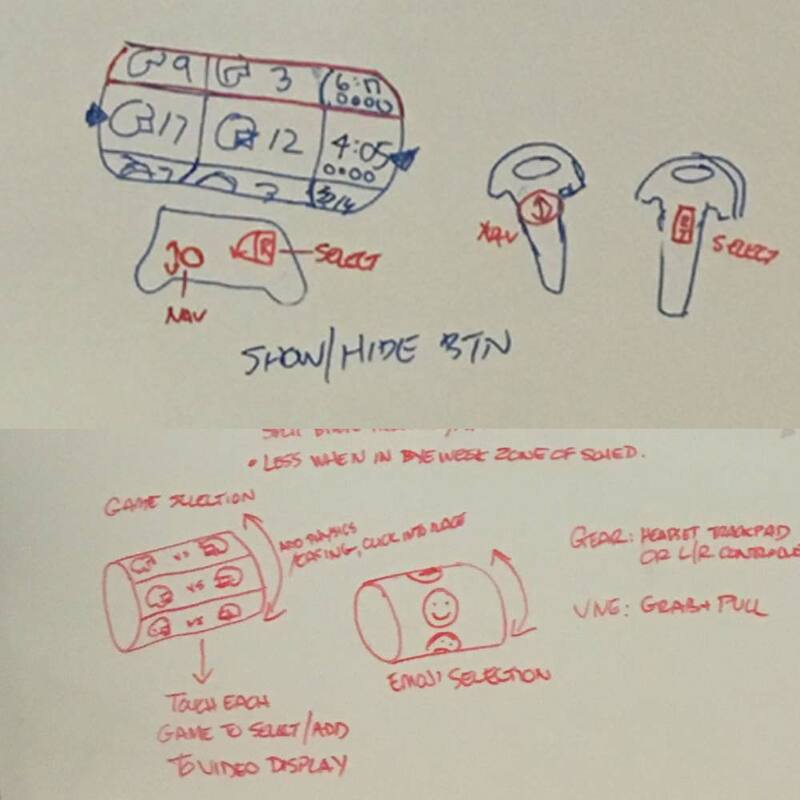 Everything around the user should be comfortable to look at, especially central focus areas. While there are best practices around distance from user to content, testing this rapidly in Unity using simple shapes to nail down specifics is recommended. When experimenting with the HTC Vive room scale VR system, I fell in love with Google’s Tilt Brush. Not only was it an absolutely incredible experience, the UI they developed to paint with is brilliant. I found myself playing with it more than actually painting. As with any UI, the experience should be simple and painless for the user to understand. In a full weekend NFL game slate, there are only 16 possible games. Typically these are broken out into morning, afternoon, evening and Monday Night. 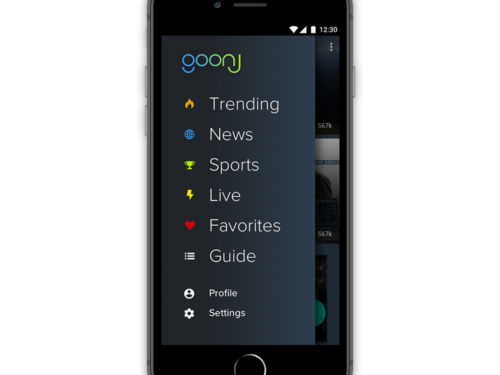 16 is a short list to scroll through, especially when it is pre-configured to have your favorite teams first. Thus “The Tumbler” was born. Watching football on TV has been reduced to watching it on black rectangles mounted on a wall. We all perceive it as a flat object. The amazing thing in VR is that those perceptions can be blown to bits. The Cube is a multi-faceted viewing device. It’s look like a normal large screen, but when the user interacts with it, watching football is only one of its many facets. Rotate The Cube (imagine seeing that spin out of your living room wall) to reveal Fantasy Stats send a Tweet or purchase something through integrate ecom. I teamed up with DLAB’s ace Unity developer Sam Jolly to produce a prototype featuring The Tumbler and The Cube. The video below is a screen recording of Sam’s interactions in VR through Unity, using a tethered HMD and bluetooth game pad.